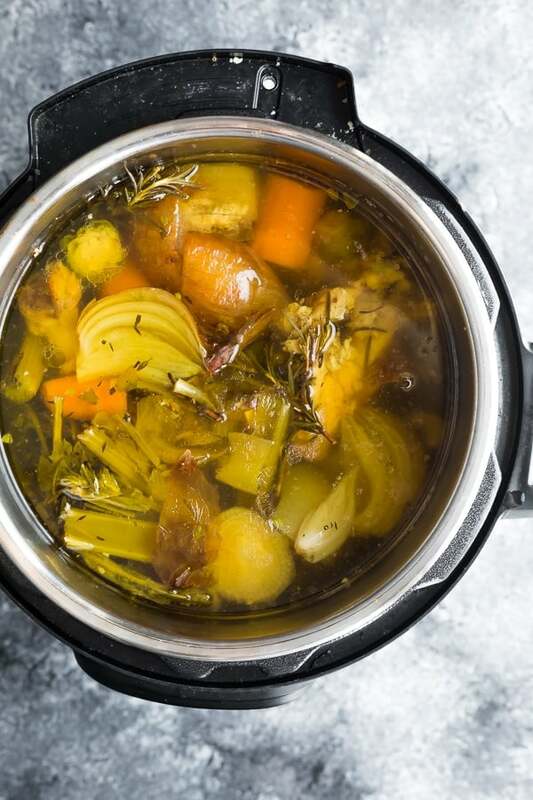 Leftover turkey bone broth is the perfect way to use up your turkey leftovers! Nutrient-dense, immune-boosting, and the best way to use every part of the turkey. I don’t know about you, but the day after a turkey dinner, I am lethargic and feeling a bit depleted. It could possibly because of the energy involved in cooking and hosting a turkey dinner, but also from over-indulging in too much rich, heavy food. 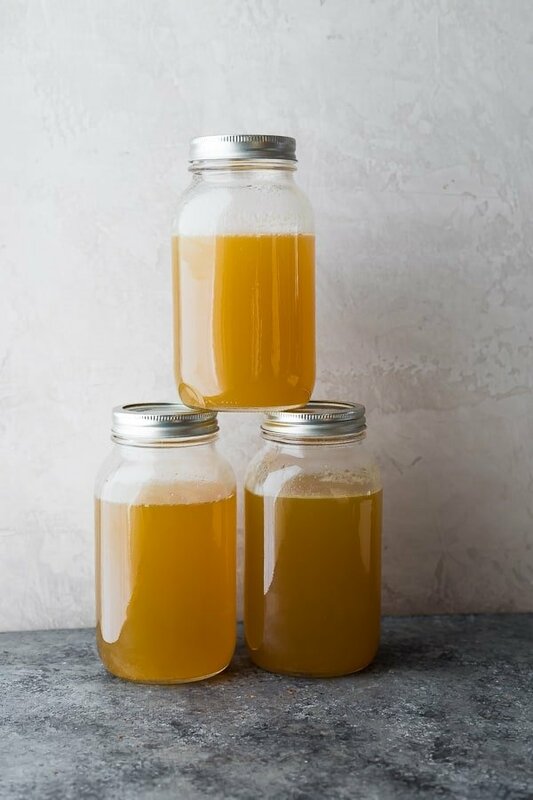 I am craving a little ‘detox’, and this turkey bone broth recipe is just what the doctor ordered! Not only is bone broth nutrient-dense, full of natural collagen, and hydrating, but it’s the best way to use every part of the turkey. I hate seeing those bones and the bits of meat stuck to them go straight into the compost. PST! 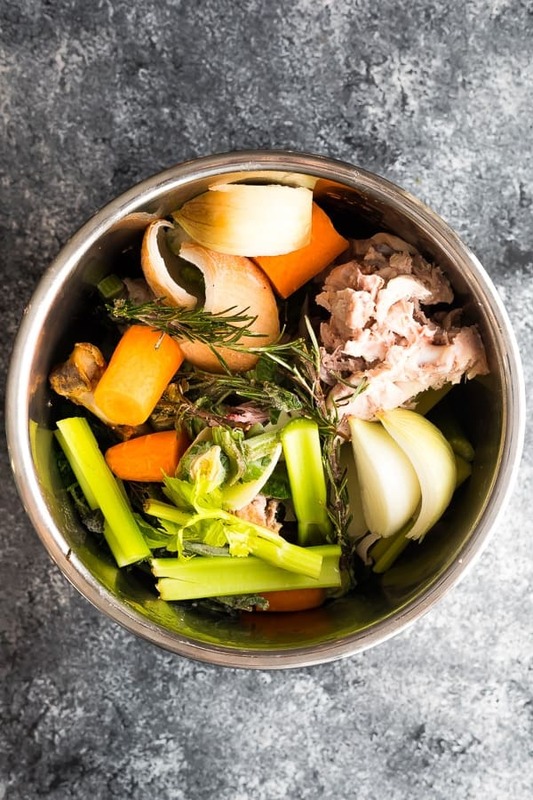 Check out this post for a great Turkey Stock Recipe! Thanks to the Instant Pot, it’s super simple to make this turkey bone broth recipe! Add 1.5 – 2 lbs of turkey carcass to an Instant Pot. Add all different parts especially ones containing cartilage. I recommend adding the wings as they are great sources of collagen! Add veggie scraps & leftover herbs that you collected while prepping turkey dinner. You can stash them in the freezer until you’re ready to make your bone broth. Add apple cider vinegar and water. The ACV helps pull the minerals out of the bones. Pressure cook for 2 hours. Let it naturally release for 10-20 minutes. Strain off the bones & veggie scraps. What’s the difference between turkey stock and turkey bone broth? They are very similar, however bone broth is either simmered for much longer or pressure cooked in a way that extracts the collagen from the bones and joints. 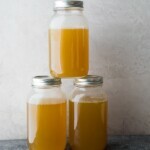 Bone broth will gel when cooled, whereas turkey stock will remain liquid and is thinner in consitency. 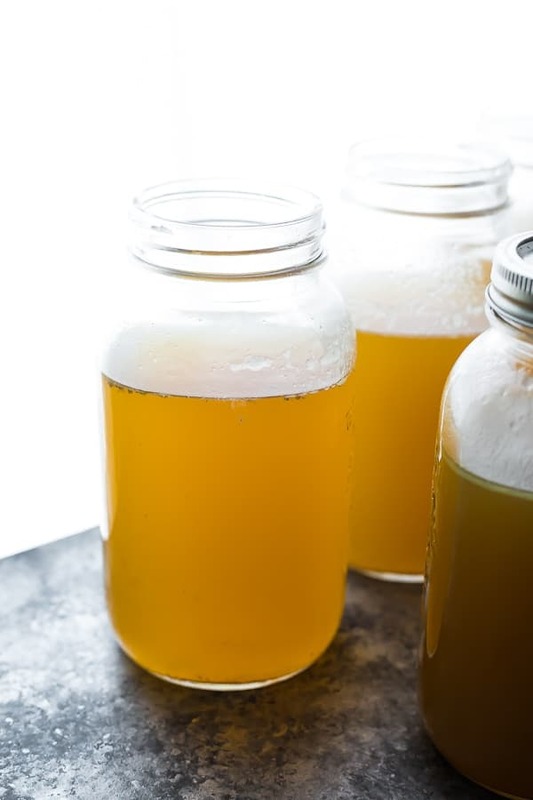 Why should I drink homemade bone broth? Bone broth is FULL of nutrients, collagen and gelatin, which is great for your hair, nails and skin (hello, fountain of youth!). Not only that but it’s great for healing your gut, supporting your immune system, and protecting your joints. See more details here. Whoa. My bone broth gelled when I cooled it! What’s up with that? That’s actually a great sign that your bone broth is rich in gelatin! Just like jello, which gels thanks to gelatin. If your bone broth doesn’t gel, don’t worry, it probably just means that you didn’t have quite enough gelatin-rich bones in your stock, or maybe you had a lower bone : water ratio. You will still have plenty of nutrition in your bone broth! How long is this turkey bone broth recipe good for? I would keep your homemade bone broth in the refrigerator for no longer than 5 days. You can freeze it for up to 3 months. scraps from turkey dinner prep: carrot peels, celery leaves, etc. Combine all ingredients in a 6 quart Instant Pot. Select manual (high pressure) for 120 minutes. Allow pressure to naturally release for at least 20 minutes, or until fully released. 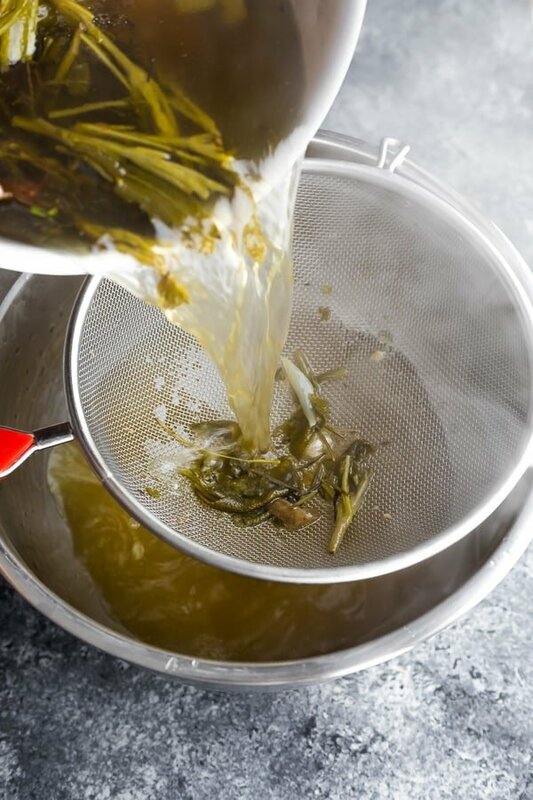 Pour through a colander, collecting the bone broth in a large bowl or a jar. Toss all solids in the compost. Always have to buy an addt’l turkey when they’re on sale! So we had one last weekend & I figured there had to be an instant pot stock recipe out there! Absolutely wonderful recipe…thank you for sharing! As an added note: meats, dairy, bones & citrus DO NOT get composted in a normal compost bin/pile. Those will add bacteria and/or disrupt the normal healthy breakdown of compostable materials. So happy you enjoyed, Laura! That’s so interesting about bones in the compost. We never added them because we didn’t want to attract animals but I didn’t know about the bacteria. Thanks for sharing! I received an Instapot for Christmas and what a perfect way to christen it by making turkey bone broth. I just made this bone broth in an 8 quart instapot and increased all the ingredients accordingly. It came out perfect. Thanks for the recipe!! Hi Daryl! I’m so happy you enjoyed it! I’ve been thinking about getting an 8 quart IP. Thanks for leaving a review!